Taking care of your lawn mower will lengthen it’s life as well as eliminate many time-consuming problems. The manufactures maintenance manual for your lawn mower is the best guide. Always check the oil level in your lawn mowers engine before starting it. use the proper engine oil and change the oil at least once a year in the spring before the season begins. Mow at the proper cutting height for your lawn. Adjust a reel lawn mower by raising or lowering the rollers by the knobs or screws in each end. Measure the distance between the bed knife and a hard surface to check the cutting height. Adjust a rotary lawn mower by raising or lowering the wheels. Some rotary mower blades are at the same level as the skirt so check the cutting height by measuring the height of the skirt above a hard surface. 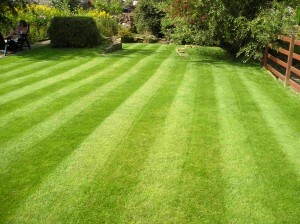 You can always determine the cutting level by cutting a small section of lawn and measuring the height with a ruler. Keep the lawn more blades sharp. The blades of rotary lawn mower are easy to sharpen at home. Only a small portion at the end of the blade actually cuts the grass. Sharpen the edge with a file or grind stone, making sure to even out any rough spots. Check the balance before remounting. Because of their position, blades of reel lawn mower are tricky to sharpen at home. Take any lawn mower to a shop if you have doubts about sharpening it’s blades. Remember that every lawn mower has other maintenance needs to keep it in working order. Be sure the motor oil is at the proper level. Clean the lawn mower blades after use with a soft spray of water. Forceful cleaning with water or air can push dirt into delicate bearings. Do not spray water on hot engines. Keep gaskets and fittings tight; gas or oil leaks kill the grass. 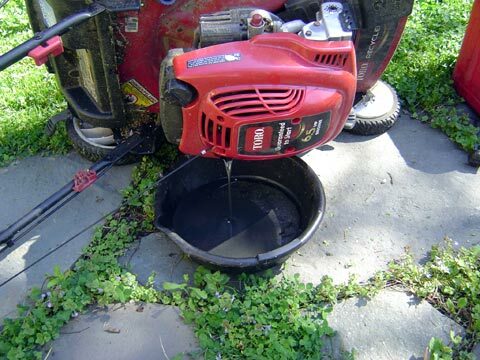 If you store your lawn mower in the winter, clean and drain the gas tank. In the spring, change the oil, clean the spark plug, and refill the gas tank. For lots more maintenance information, click here. Now is the time to complete Lawn Mower Spring Maintenance and also the annual maintenance on your snow blower at the same time. Doing both machines at the same times saves time and you only need to get dirty one time. Change the oil in both machines, check the spark plugs, make sure the cutting blade is sharp and compete any other repairs that are needed on your lawn mower and snow blower. Grease the auger, check the belt tension and review the belts for any wear and tear. All of this work can be accomplished in a few hours and save you hundreds of dollars later on in repair costs, frustration or worse buying a new machine. In summary, lawn mowers are pretty easy to maintain. Change the oil once a year minimum. In the fall drain all of the fuel out of the gas tank and carburetor. Alternatively you can just let the engine run until all of the gasoline is burned off. Also check the spark plug to make sure it is properly gaped and also clean from deposits. If your spark plug is not in good shape, the engine may run rough or not at all. 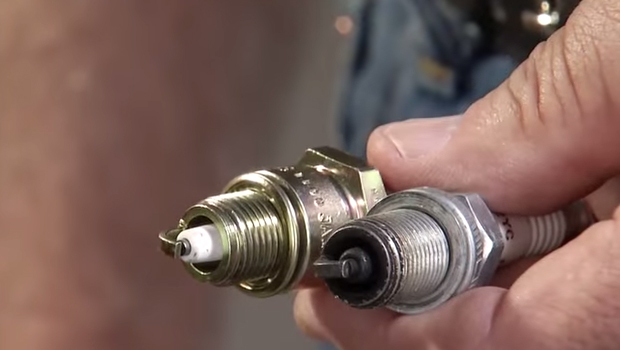 If it looks bad, replace the spark plug with a new one after properly setting the gap. An hours work will make sure that your lawn mower runs well for many years. These checks are easy to do and most do it yourself consumers can handle this job easily. Many home owners don’t bother with lawn mower annual spring maintenance. They just pull their lawn mower out of the garage, add some fuel to the tank and pull on the starter chord. In most cases, after a few pulls on the starter chord the engine coughs and starts. It may run rough for a little while, but then once new gasoline gets into the engine it smooths out and runs well. You might even get away with this for several years. Eventually the engine will not start at all and will require a complete overhaul. The engine oil is black. The carburetor is gummed up. If you want many years of use from your lawn mower, complete a lawn mower annual spring maintenance every year. Here are a few spring maintenance tips that will help to keep your lawn mower running for many years. Wondering what will a bad spark plug do for a lawn mower engine? It will make it difficult to start at the very least. It may cause the engine to run roughly. A bad plug may cause the engine to burn more fuel than normal ans spew more noxious exhaust. Finally it just may not start at all. Leaving you to wonder how to get your grass cut and who is going to repair your lawn mower. There may be a number of things wrong with your lawn mower engine. However checking your engine’s spark plug is one of the easier things to do. The simplest thing to do is to replace the spark plug with a new one after properly setting the gap on the center post. Replacing the spark plug will ensure that there is no soot or deposits that might be inhibiting the spark that is needed to ignite the gasoline in the combustion chamber. You can also clean the existing spark plug. You will need to use a wire brush to remove all deposits from the spark plug. Use a bit of sand paper to clean the end of the center post and the rest of the surrounding area. Make sure there is no carbon deposits that are adhering to any metal parts. Reset the gap according to the manufacturers instructions. Reinstall the plug and test the engine by starting it to see if this makes a difference. If not you may have other issues that need to be addressed. There could be a bad gasoline filter or a gummed up carburetor from old gas sitting too long in the gas tank. You will need to get these cleaned and re-calibrated for your engine to run smoothly. Spring is a great time to tune up your lawn mower and get it ready for the coming season. We get questions from readers such as, can bad spark plug affect lawn mower engines? The answer is definitely yes. An engine with a dirty spark plug can be difficult to start. When you finally get it running, the engine may run poorly and shut off often. There can be a number of reasons this is happening, but one for sure is a bad spark plug. What do we mean by a bad spark plug? It is dirty around the electrode with lots of carbon deposits and the porcelain may even be pitted. All of these things will impede the spark that ignites the gasoline oxygen mixture in the cylinder causing a rough running engine. It may not even start. If you have this problem, the easiest thing to do is to remove the spark plug and clean it up. Remove all of the dirt and grime along with any carbon deposits. Once it is clean and spotless, reset the gap according to the manufacturers specifications. You can test your spark plug by reattaching the spark plug wire to the plug. Hold the spark plug against the metal housing of the engine to ground it and crank the engine several times to generate a spark. If you do not see a spark you may not have grounded it properly or there is something additionally wrong with the spark generation system. You may need to investigate further, but at least you know that the spark plug has been cleaned and / or replaced. There are a number of variables to consider when consumers try to answer the question, is it better to repair a riding lawn mower or buy new. What will the labor cost be? Can you do the repairs yourself? What parts are needed and can you even get them? Have the parts for your machine been discontinued? Engine parts and transmission parts tend to be more expensive and depending on the machine difficult to obtain. Consumers also need to be able to transport their existing riding lawn mower to the repair shop. Even if it is just for an estimate. The answers to all of these questions will help you answer the question above. Is it better to repair a riding lawn mower or buy new. The other big question si what will a new riding lawn mower actually cost. They can range from $700 to more than $5000 depending on the horsepower of the engine. In addition to the features that they may have. Do you need a simple riding lawn mower to just get your large lawn mowed? Or do you need something more substantial with more power and the ability to add attachments for other jobs around your yard? The best approach to answering this question is to get quotes for the repairs you may need to have and quotes for a new riding lawn mower. If the buy new quote is close to the repair cost, then you might as well bite the bullet and purchase a new machine. The question, should i change oil in my lawn mower spring or fall, is actually a little more complicated that one would think. Your lawn mower’s instruction booklet will tell you how often you should change the oil based on the number of hours the engine is running. Most instruction booklets also suggest that the oil should be changed a minimum of once per year if not more often. Consumers with a small lawn who may run their lawn mowers for less than 30 minutes per week can get away with annual oil changes. Consumers with larger lawns may need to change the oil in their lawn mowers twice a year or even more often. If the oil in your lawn mower is getting black or more than a year old, you should change the oil before using the lawn mower further. Check the level of oil in the engine often and monitor the color each time as well. Our personal suggestion is to change the oil near the beginning of the season in the spring. By changing the oil at this time, your engine has fresh oil that has not degraded over the winter with the engine contaminants. Run the engine for five or ten minutes to warm up the oil and then drain the warm oil from the engine. Add the proper amount of oil with the recommended viscosity. Your booklet for the lawn mower will tell you what kind of oil to use and the viscosity. Follow the oil changing instructions provided. Changing the oil on a regular basis in the spring will ensure that your lawn mower engine has many years of operation to provide to you. Lawnmowers are used during warm seasons such as late spring, summer and early fall and as a result temperature variations are pretty moderate. 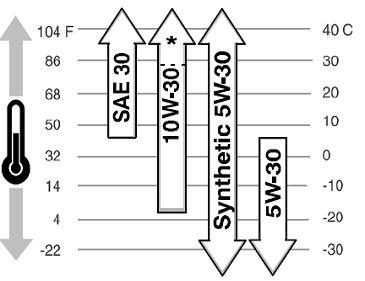 As the chart shows on the left, you typically can use SAE 30 viscosity oil, 10W-30 and 5W-30 viscosity oil in your engine. Always read the owner’s manual to confirm the viscosity level recommended for your particular engine. In case you are wondering, viscosity is a measure of how well oil will lubricate moving parts inside the engine while it is operating at specified temperatures. It is particularly important that oil provide enough lubrication when the engine is cold. Abnormal wear could take place if you have the wrong oil in the engine or if you do not have sufficient oil in the engine. We will discuss a couple of maintenance tips in the following paragraphs. Change the oil at regular intervals. The oil in your lawn mowers engine should be changed at least once a year for most consumers. Unless you have a large property, use your lawn mower for commercial lawn mowing etc. If the engine oil is black looking, then it is definitely time to change the oil. Change the oil at the beginning of the season, so that there is fresh oil in your engine for the season. Always run the lawn mower engine for 5 or 10 minutes before changing the oil. This will warm up the oil so that it will drain well when you are removing the oil. Check the oil level often – in fact check your oil level each time before you start the engine to make sure that it is at the right level. There is nothing harder on an engine than not having enough oil to keep everything well lubricated. Oil levels can drop for a number of reasons. There could be a slow leak, your engine may burn a little oil each time you run it and before you realize what is going on, you have burned out the rings and pistons. Check before starting every time even with a new engine. If your spark plug is not set up properly and not clean, there is a good chance that your lawn mower will not run smoothly. What are the signs of bad spark plug on lawnmower engines? Before you even look at the spark plug, how can you tell if the spark plug might not be working as well as it should? As with most things in life, there are symptoms of a problem which have to be diagnosed and issues eliminated before you get to the true cause of the problem. If your lawnmower engine is running rough, it is hard to start, if it is burning more fuel than usual or if there is a lot of blue exhaust then you could have a spark plug problem. You could also have a clogged carburetor, bad gas, poor spark or gas filter that is causing the problem to name a few. You have to begin somewhere and one of the easiest is to check the spark plug. The picture shows two spark plugs, one that is brand new and one that is obviously used. The used one is not necessarily bad. However the easiest approach is to just replace it with a new one of the proper specification. Follow the directions as outlined in your owner’s manual. A critical step is to make sure that you have the proper gap for your spark plug. Check the owner’s manual for specifications or your lawn mower may not run at all. You can purchase a small gap tool to set the gap following the instructions that come with the tool. Once you have replaced the plug, try starting your engine. If it runs fine, problem solved, if not you will have to try other repair items as mentioned above, eliminating one at a time. Many people will just clean up the old spark plug and reinstall it. This is ok, provided that the porcelain is not cracked around the center post. Make sure all soot is removed from the plug. You will also need to check the gap as mentioned above. Make sure it is set to the proper specification. 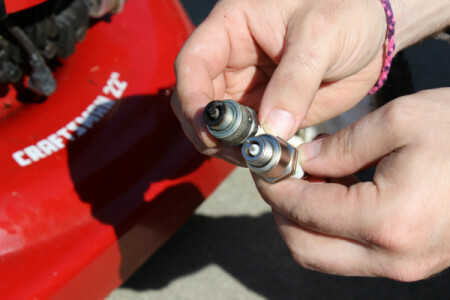 Depending on how much you use your lawn mower, you may not have to change your spark plug. Daily use of a lawn mower usually means annual changes of the spark plug. Also regular changes of the oil in the engine as well. Sometimes lawn mowers are hard to start and there can be multiple reasons for this common problem. One of the most common problems is when you try to start a lawn mower after it has been sitting for a long time. Usually over the winter with old gas sitting in the gas tank. The gasoline becomes stale and usually gums up the gas tank. It gums up the filter in the gas tank as well as the carburetor. This means that your engine either does not get enough gasoline or enough air and runs rough or not at all. They can be really difficult to start and when you finally get it running, the engine revolutions may cycle from running high to almost stalling due to lack of gasoline. If this happens to you then there is really no choice but cleaning the carb or replacing some of the smaller parts in the carb. You should also get rid of the old gasoline by taking it to a proper disposal site as well. Never dump this old gasoline. The easiest way to avoid this problem is to burn off all old gasoline in the fall. Let the engine run until it runs out gas. Use new gasoline in the spring and should be fine. Many consumers will also use a gasoline additive to help keep the gasoline fresh. It helps to void the separation of components inside your gas tank. In the spring another preparatory activity for your lawn mower is to remove the spark plug and clean it. Or replace it with a new one that is properly gapped. It is also a good idea to change the oil at the beginning of the season. Run your engine for several minutes to warm up the oil so that it flows smoothly. Drain the oil out of the engine reservoir. Your engine will run much better with fresh gasoline, a new spark plug or one that is cleaned and new engine oil. It will be much easier to start as well. If you use your lawn mower everyday or at least every week, you probably do not need to be concerned about fuel stabilizer for lawn mower engines. The gasoline never gets stale and does not create gum deposits in the fuel line or the carburetor. But most of us use our lawn mowers for three seasons. Then they sit idle during the late fall and winter months. This is the perfect amount of time for gasoline to get stale. It can also gum up your lawn mowers engine. This makes it very difficult to start the engine. In many cases the lawn mower engine will not start at all. This is the main reason why fuel stabilizer for lawn more engines should be used in all gasoline tanks. 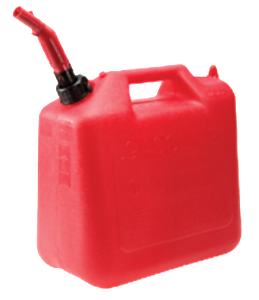 Every time you fill up your tank, add some fuel stabilizer to the gas can. Follow the instructions on the fuel stabilizer to make sure that your adding the correct amount to each gas can. This will ensure that each tanks of gasoline is stabilized, will not go stale and most importantly will not gum up your engine. If you use the same gasoline for your snow blower, this approach will ensure that you always have good gas for your small engines. 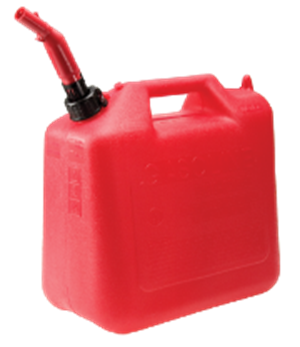 If you know that the gasoline will be sitting around for a long time, it is best to just put it in your cars tank and use it rather than have it sit for a long time. Never put old gas in your car’s engine. You do not want to have car problems caused by old gasoline. The guidelines for a small engine starting guide apply to lawn mower engines, to snow blower engines, to many small engines that are used for both landscaping as well as leisure activities. All of these engines are just miniature versions of the more common car engine. Although much less complex and therefore easier to maintain. The basics are clean gasoline, fresh gasoline, regular oil changes. Also regular inspection of spark plugs, belts and other moving parts such as the wheels and drive shafts for self propelled models. We compiled a list of items that should be considered as part of a small engine starting guide. If you want your small engine to always start easily, try to follow these tips to ensure that your engine is clean and always ready to start at a moments need. These tips are fairly easy for the average handy man to keep up with. However we urge anyone performing any of these maintenance steps on small engines to thoroughly read the manual first. Follow all safety precautions before starting any of the maintenance activities. Many people are hurt every year by failing to disengage the spark plug for example and accidentally starting the engine. If in doubt, ask for help or take your small engine to an expert. Even though it will cost you some money, it may be better than being hurt seriously by an engine that starts accidentally. If the cost of maintenance and / or repairs is too much then sometimes it is better to just purchase a new lawn mower or other small engine that you need. Your old lawn mower is not running very well and you suspect it is time to either get a new one or do some repairs yourself. Inexpensive lawn mowers can be purchased for less than $200. So consumers need to be careful regarding how much money they spend repairing these machines vs. just going out and buying a brand new one. If you worried about disposing of the old one, just leave at the end of the driveway. Someone will come along and pick it up, fix it and sell it to another consumer who is looking for an inexpensive lawn mower. When the lawn mower is free and the labor is free, these lawn mowers are sold for pure profit. The real question is why can you not repair your own lawn mower. Or better yet keep it in tip top shape so that it continues to run for years? The following are the steps that you need to do in order to keep your lawn mower running in tip-top shape and that is why we call it the lawn mower start guide. If you follow these steps routinely, there is a very good chance that your lawn mower will start easily every time. The most common problem for lawn mowers or any small engine not starting easily is poor maintenance. Also old gasoline, gasoline left in the tank for a long period of time and bad spark plugs. Many consumers use riding lawn mowers for much more than just cutting the lawn. They use them for transportation across their property, they pull small trailers and they add attachments for a variety of jobs around their property. It is important to always have them start easily and that means keeping up on the maintenance of these machines. One of the most important things is clean oil along with fresh gasoline and clean fuel systems. If you do not keep up with these basic maintenance items, chances are you are going to have much more serious and expensive maintenance activities to be concerned about. You may even have to purchase a new riding lawn mower. We put together a few tips to help consumers stay on top of the basic maintenance for riding lawn mowers. 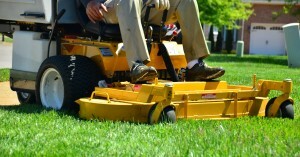 You can apply these tips to regular lawn mowers and many other small engines that you may use. Change the oil after every 50 hours of operation or at the end of the season. Oil degrades over time and is only optimum for about 6 months. When not using the riding lawn mower, start it once a month. Starting the riding lawn mower keeps stabilized fuel in the fuel system. Change the spark plug every two years or at the very least clean it every year. Check air filter and clean it every season unless you are in very dusty conditions. Then check and clean it every month. Following these basic steps will go a long way to making it much easier to start your riding lawn mower easily every time. Ever wonder why some lawn mowers start easily and others do not? Routine maintenance is the key to easy starting of your lawn mower. We will cover a few tips later in this post that just about all consumers can easily follow. The picture on the left shows two spark plugs. A brand new one and the other just recently removed from the engine. The one with that is black will make it more difficult to start the engine, if it does run, will run rough or cause more pollution than a new one or at least one that is properly gapped and cleaned. The dirty one is coated with tar and black deposits that can weaken the actual spark generated by the spark plug. If it is really bad, it may retard the spark completely making it impossible to start your engine. Your carburetor will be equally dirty from deposits from gasoline coating it and may even block the intake of gasoline to the engine. This can also be a serious problem when it comes to starting an engine. 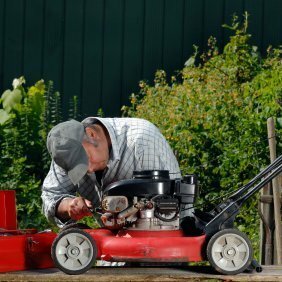 We put together a quick start guide – lawn mowers to help consumers avoid this kind of problem and repair costs if you need to take it to a small engine mechanic. If you use your lawn mower a great deal, change the oil in your engine after every 50 hours of operation and at the beginning of the season. Start your lawn mower once a month. Change or at the very least clean the spark plug every two years. In addition to being able to start your engine easily, these actions will also ensure that your engine will last a long time and not begin burning oil. Always check the oil level to ensure that there is sufficient oil in the reservoir. Top up if needed, however avoid over filling since too much oil can increase the pressure inside the engine and cause other problems to develop. Always measure the oil level when the engine is cold and on a level surface to obtain an accurate reading. Basic lawn maintenance is pretty simple , unless you want a perfect lawn. Then it takes a little more work to obtain that golf green type of lawn, that has a manicured look to it and is the envy of the neighborhood. In the last few posts we have been discussing some of the steps that homeowners need to take to have a really great looking lawn. In this post we will discuss how to have a perfect lawn that is truly the envy of the neighborhood and something that you can be proud of. It can take just a few extra hours each week to make sure that your lawn is healthy and looking great. The first step is to make sure your lawn gets regular watering so that it never dries out. If you receive enough rain then you may not need to water that much. On the other hand your water system should include at least one inch of water at least once per week and more often if you live in a dry climate. Next cut the lawn when there is no more than one inch of grass to cut. This will mean that you are cutting the lawn more often, but you will have a more manicured look to your lawn as a result. Always make sure the blade on the lawn mower is sharp so that it cuts rather than tears the blade of grass. These two steps will ensure that you never place the lawn in any kind of stress and the ends of the blades have a cut look to them instead of being torn away. There are several more things to consider. Apply fertilizer at least 4 times a year using the appropriate fertilizer for the time of year and use a spreader to apply it. Never fill the spreader while on your grass to avoid spilling and burning your grass. Follow the recommended spreading directions. The fertilizer should help blade growth and root expansion to ensure that your grass remains healthy all year long. It is better to spread the fertilizer thinly and travel over the lawn several times to avoid any chance of burning the lawn. You will also have a better distribution of the fertilizer as well instead of concentrating it in the areas that you have traversed. Weeds are a big problem in some areas. You may have to pull the larger ones such as thistles and dandelions by hand. While smaller weeds need an application of weed killer on a regular basis. A thick healthy lawn makes it more difficult for the weeds to grow. You will have many less to deal with as a result. Also apply lawn seed with top dressing at least once per year to thicken the lawn. 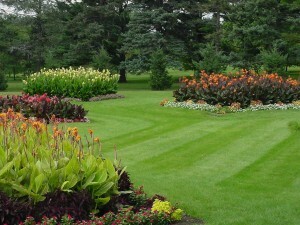 What are the lawn care services that you really need to maintain your lawn in perfect condition? 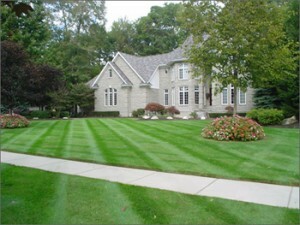 Can your lawn look like this one? What will it cost to have a lawn that is always in perfect condition? We put together a list of steps that just about anyone can follow. You can have a great looking lawn and not cost too much money at the same time. You may decide to have someone look after your lawn for you. Use this list to decide what you will do. 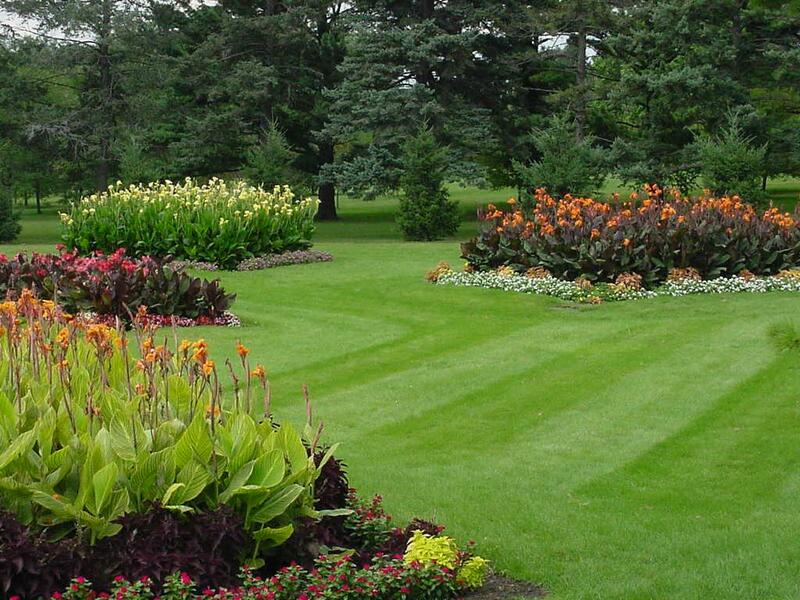 What lawn care service you need to have a lawn maintenance company do for you. If you are considering a lawn care service, prepare your list. Provide this list of requirements to several lawn care companies to request quotes for the services. By using exactly the same list you will find it much easier to compare quotes. This includes prices and services that they offer. Everyone wants to have a perfect looking lawn. There is no reason why you cannot have one too at minimal cost. Each week you need to cut the lawn and perhaps even more often if you have a fast growing lawn. In addition, remove any large weeds that you see such as dandelions and thistles. Smaller weeds must be dealt with by using some form of weed control. In addition water your lawn at least once a week if it does not rain sufficiently. In dry climates, daily water may be needed. Cutting the lawn more often before the grass gets too long is actually easier to do and if you use a mulching lawn mower, there is no grass clippings to worry about as well. Prepare a schedule to apply weed control and grub control if you feel that these are required. Your lawn care service will look after this for you. Apply grass seed and top dressing to any areas that may be thinning out. Remember you need to water this area daily to help the new grass take hold and grow. Fertilizer every three months is usually needed and use the appropriate fertilizer for the time of year. For example a fertilizer that promotes root growth is usually suggested in the fall and one that promotes leaf growth in the spring is suggested. Apply weed control an bug control as needed. Remove all debris from your lawn in the late fall after you have cut the lawn for the last time. The same thing applies in the spring before you cut the lawn or apply fertilizer. You will want to make sure that there is no debris such as leaves and branches that could stunt or even kill the grass even over the winter months. Lawn care service prices vary a great deal depending on what work you need to have completed, how often you will be having the lawn mowed for example, how large your property etc. The property shown in this picture is going to require a lot more time to maintain it. Compared to someone who has a small lot that is the standard 50 foot by 100 foot lot. How do you find out whether you are potentially going to pay too much for lawn care service prices? You also get what you pay for. If for example you drive the price so low that the lawn care company feels they are losing money. They will begin to cut corners just to be able to make a small profit. Your lawn will begin to suffer. Still, you cannot blindly pay for things without verification and some negotiation. Otherwise you could end up paying much more than you should be. By far the best way to determine how much you will need to pay for lawn care is to ask for several quotes from several different companies. Make sure that the quotes are for the exact same services. Make sure there is no difference based on the scope of the work that needs to be done. Be very specific about your needs so that there is no room for misunderstanding. You may also want to compare prices with neighbors if they have similar sized lawns to be maintained . Again you are going to have to compare specifics. Make an apples to apples comparison. Once you have this information you can make a much more informed decision regarding the price for the work that is being completed. Note that if the company is really busy and really does not want or need the business, they may still quote, but they will quote high just in case they win the business. At least they get paid well for their efforts! This is a fairly common practice in the industry and also why you need to ask for several quotes from several different companies. While price is important, so is the quality of the work. Consumers may want to ask for references regarding punctuality. Also how well the work is completed and whether they clean up after they are finished. The last thing you want is grass clippings all over your driveway or sidewalk. They not only look bad, but can get tracked into your home as well. Talk to other customers as well to get a feel for the quality level of the work that is being done by each contractor. Factor this into your decision. Lawn care service prices will depend on all of these factors. Finally during the first few times they work on your lawn, it is a good idea to observe the level and the quality of work. You will want to make sure that they are doing all of the things that you asked them to do as part of your contract. You also want to confirm the quality level that you were expecting. Finally there may be small issues that you need to make the foreman aware of in terms of your lawn. Focus on how various elements are to be looked after. Basic lawn care maintenance can be pretty easy and straightforward as well as routine if done properly. You can of course pay someone to look after your lawn. They can do the basic maintenance, however you’ll miss the satisfaction of doing it yourself. Also the exercise that you get being outside working in your yard. We know lots of people who enjoy this type of work. They prefer to take their time to complete the lawn maintenance exactly in the manner they like. Here are some of the basics for having a great looking lawn that you will be proud of and your neighbors will envy. Cut the lawn once per week at a minimum, and whenever the lawn has grown by 1/2 inch. This is the optimum time to cut your lawn. It will do the minimum amount of damage to your lawn and also if you’re using a mulching lawnmower, the blades of grass will be cut into tiny pieces and will disintegrate adding nitrogen to you a lawn. Always make sure that your lawn mowers blades are sharp so they cut the grass cleanly. A good practice is to have your blades sharpened at least once per year. Fertilize at least four times per year. Fertilizer should be added in the spring, early summer, late summer, and early fall. Depending on the time of year you are adding fertilizer, you will want to use the proper mix of fertilizer to ensure maximum growth of both the roots and the grass. Your local hardware store can provide advice regarding the type of fertilizer to use depending on the time of year that you are applying fertilizer. Apply grass seed and top-dressing in the spring to add additional nutrients to your lawn, as well as to thicken up your lawn . Make sure that your lawn receives adequate watering, especially if you are experiencing a dry period. Water your lawn at least once per week providing a thorough soaking. If you’re getting sufficient rain, you will not need to add additional water. A thick lawn that is well maintained will prevent the grass from drying out as quickly as it would during dry periods and make lawn care maintenance that much easier. A thick lawn protects the roots and helps them dig deeper to find the nutrients and the moisture they need. also to avoid having to use chemicals on your lawn. Many people use chemicals because it is easy. However it only takes about five minutes a week once you get your lawn in shape to deal with any weeds that you may have. This is the basic level of maintenance that you must follow to ensure that you have a really great looking lawn. It will be the envy of your neighbors. Your wife and family will be happy as well with your efforts . They will certainly let you know if it is not in good shape. An hour or two a week is all it really takes to have a nice looking lawn. Your neighbors will also pick up on this and keep their lawns looking better as well. A great looking lawn will also increase the overall value of your home and make it much easier to sell when the time comes. Yard maintenance services can include many activities and it is helpful if you are clear with the company you are dealing with, what services you are looking for. We are going to list some of the many services that can be included in yard maintenance and it is up to the reader to determine what services they need to have. These services are often done by the homeowner themselves until something occurs that prevents them from continuing to do so. At that point the work may seem overwhelming and they decide to move rather than arrange for yard maintenance services to be performed for them. This may seem like a long list. Consumers may not need all of the above functions that are needed. This will depend on the type of home they have, the size of the lot they have and their interest in many of the things above that would require the types of yard maintenance services that are listed above. Not all companies will provide these services, so consumers may have to hire handyman yard maintenance personnel to perform these services. Consumers have a choice between what services they hire yard maintenance men for and those services or jobs they are going to do themselves. As long as you are healthy and physically able to do some of this work, why not do it yourself and save some money as long as you can do the work safely. As long as time permits and you are able, doing this work gives a person a sense of accomplishment, you are outside enjoying the sun and you have fun doing it. Painting windows is one area that many people avoid simply because they need to get up on a ladder and they find it awkward and perhaps a bit dangerous for them. This is the time to hire someone to do the work for you and avoid any potential accidents. Another area that many people will contract out to a yard maintenance company is fence repair and / or rebuild. This can be physically very difficult work and many people cannot seem to be able to handle this work. They may also not have the tools and just prefer to have someone do all of the work. They want to avoid getting into this kind of job. Building fences takes a bit of skill, however most handyman can do it themselves. Finally one other area that anyone can do is watering your lawn. Most lawns need about an inch of water every week. Unless you have an automatic watering system, you will need to move the sprinkler around to make sure every area will be covered properly. Hiring yard maintenance men to do this work does not make sense in this example. If you are planning an automated watering system, a yard maintenance company might be willing to install one for you. However this is also specialized work and consumers should first confirm their experience installing this equipment. 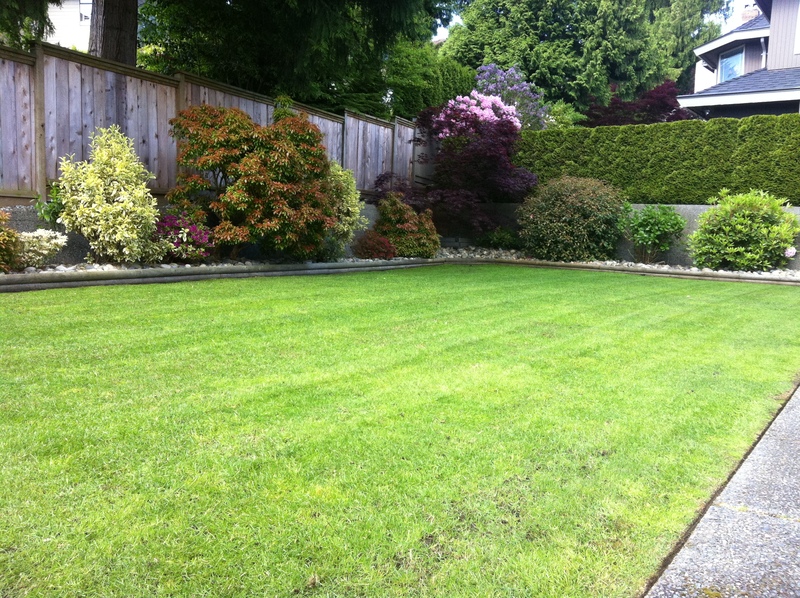 Yard maintenance services work can be relaxing and enjoyable. But if you do not have the time or just do not want to do the work, then hiring a yard maintenance company to do the work for you makes a lot of sense.